The pyridine-based products discussed in this report include pyridine, picolines (alpha-, beta-, and gamma-), 2-methyl-5ethylpyridine (MEP), lutidines, and collidines. Synthetic processes produce pyridine-based products by reacting acetaldehyde and formaldehyde (or paraldehyde) with ammonia. Pyridine can also be extracted from coal tar; these “natural” pyridines are generated during coking operations and were the sole source of pyridine bases until the early 1950s when synthetic production began. Synthetic processes now account for almost all of the pyridine produced globally. Synthetic processes account for the majority of the world production of pyridines. These processes allow for the production of a more consistent product and ensure a reliable supply over natural sources. The availability of naturally derived pyridines is grossly insufficient to meet demand. The majority of synthetic processes do not yield a unique product but produce a mix of bases, the composition of which can be somewhat influenced by specialized technology, reaction conditions, and additives. Pyridine accounts for more than half of the total consumption of pyridine bases. Agricultural chemicals, mainly the nonselective contact herbicide paraquat, account for most consumption of pyridine; however, there is also some demand for piperidine and 2-chloropyridine in some regions. beta-Picoline, the second-largest product, is used primarily to produce niacinamide/niacin (vitamin B3), and is forecast to have the strongest growth in 2018–23, as a result of growing demand for niacinamide/niacin in developing regions for use in animal feeds (mainly for poultry and dairy cattle). 2-Methyl-5-ethylpyridine (MEP) is used nearly entirely to produce niacin, primarily by Lonza in Europe. The largest market for alphapicoline is the production of 2-vinylpyridine (2-VP); most 2-VP is used as a component of styrene-butadiene-2-vinylpyridine terpolymer latexes (SBV latexes), which are used as tire cord adhesives and in other adhesives for bonding textiles to elastomers. Huge capacity additions in China have pressured producers in other countries to reduce operating rates or to consolidate. Most of the capacity additions in Asia were installed to meet strong demand for paraquat and niacinamide/niacin production. Since 2010, consumption has grown significantly in China, while India has experienced only slight growth; consumption in the United States and Western Europe has declined. China is the largest producer and consumer of pyridines, accounting for more than half of the global market in 2018. In China, pyridines growth will be supported by increased niacinamide production and, to a lesser extent, demand for agricultural chemicals. New niacinamide capacity and niacinamide plant expansions are expected to come onstream in the next few years. However, China’s ban on the use of paraquat by 2020 will limit consumption in agricultural chemicals, and result in a major change in paraquat and pyridine use. Chinese consumption of pyridines will shift to other agricultural chemicals, such as diquat and chlorpyrifos, and to other pyridine derivatives. India is the second-largest producer of pyridines, and the largest global exporter in 2018. Jubilant Life Sciences, the largest producer in India, consumes pyridines for the production of a variety of derivatives, including niacinamide and 3cyanopyridine; the majority of pyridine and niacinamide production is exported worldwide. New niacinamide capacity is expected to be completed by 2020. Improving living standards and increased production of both animal feeds (primarily for poultry and dairy cattle) and agricultural crops will drive consumption in India. The largest global producers of pyridines are Vertellus Specialties, the Red Sun Group in China, and Jubilant Life Sciences in India. Together, these three companies accounted for over half of global capacity in 2018. 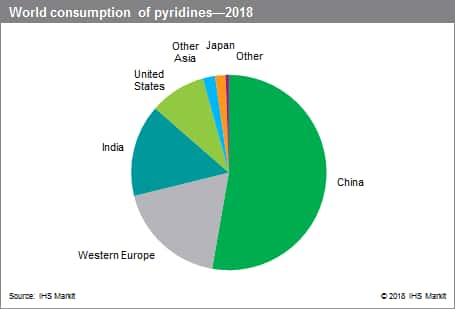 In the coming years, pyridines production and consumption growth will continue to be driven by Asia, particularly China and India.